Volkswagen Could Be Looking to Make Big Deals in the U.S.
Volkswagen is looking to make some significant moves, including more exposure to the U.S.
Ways to impress President Trump? Promise to make big-time investments in the United States, aiding in contracting, part-time and full-time jobs throughout the country. That's exactly what Volkswagen (VLKAY is doing right now. How to make him mad? Fly completely in the face of what VW is doing, announcing production halts and jobs cuts. That's exactly what General Motors (GM - Get Report) did last week, drawing a very critical response from the President. GM is aiming to carve out some $6 billion in costs and plans for some big cutbacks in its sedan production. Given the trend toward SUVs, trucks and crossovers, that move comes as little surprise. Ford Motor (F - Get Report) made a similar move this year, planning to eliminate all of its passenger cars with exception of the Mustang and Focus. Rumor has it too that Ford is weighing an even bigger restructuring than (GM - Get Report) . What that means for Volkswagen is still unclear, particularly given the automaker's recent discussions with Ford. While these discussions are no secret to the industry, the scope of what agreements the two are working toward is still unclear. Some may speculate that Volkswagen working with Ford will also coincide with more investment in the U.S. But Volkswagen isn't the only automaker trying to appease the White House. Executives from Daimler (DDAIF and BMW (BMWYY are also trying to avoid a tariff increase to 25% from 2.5%. This dramatic of a raise would deal a crippling blow to the automakers' profits. The move is being discussed despite many of the companies already producing within the U.S. In fact, Mercedes and BMW - along with Tesla (TSLA - Get Report) - are among the biggest winners from China's decision to reportedly drop its import tariff on U.S.-made vehicles, given how much these companies ship to Asia. President Trump - the "Tariff Man" - has already shown he's not afraid to ruffle any feathers in the trade dispute. In regards to Volkswagen, the question to me becomes what it's willing to do with Ford. It's already boosted its production in its Tennessee plant and is looking for a new North American plant to produce its electric vehicles. If Ford goes through a large restructuring and yanks more production, could Volkswagen step in to help fill the void? That will likely bode well with Washington, as it offsets some of the job loss by Ford. The partnership could also extend to technology and mobility. 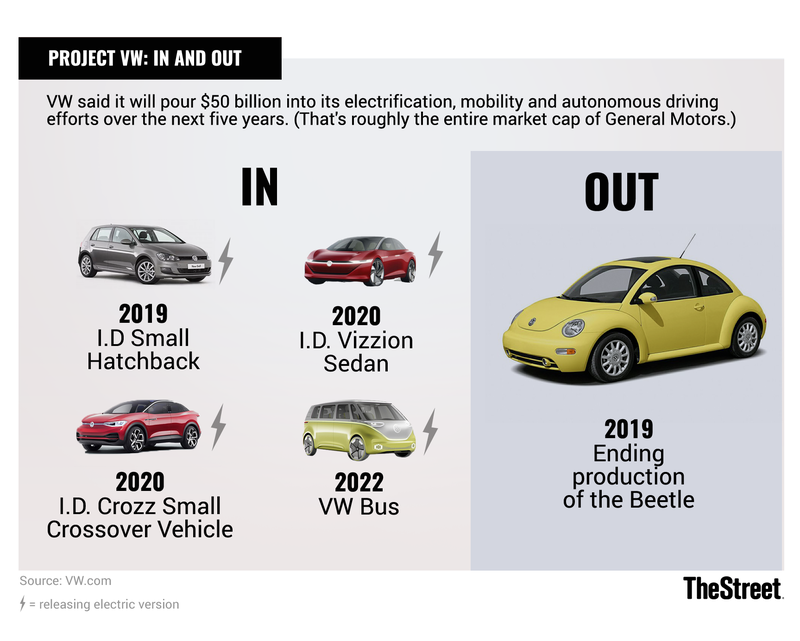 Volkswagen has already announced that it will pour almost $50 billion into electrification, autonomous driving and mobility technologies over the next five years. The automaker plans to roll out several new all-electric models - a crossover, sedan and minibus - and eventually add electrification options to more than two dozen of its vehicles by 2022. That'll be a costly retrofit, but something that VW is apparently willing to pay after its emissions scandal rocked its reputation a few years. Regarding mobility and autonomous driving, Alphabet's (GOOGL - Get Report) (GOOG - Get Report) Waymo and GM's Cruise unit look to be the leaders, with everyone else seemingly playing catch up. This race isn't exactly cheap and for Volkswagen and Ford, maybe it is a good alternative to pair up. Eventually we'll get some clarification on what the two plan to do, but one thing is clear: Volkswagen wants more exposure in the U.S. and improved technology, and it's willing to pay plenty to get it. Alphabet is a holding in Jim Cramer's Action Alerts PLUS member club. Want to be alerted before Jim Cramer buys or sells GOOGL? Learn more now.